Description: This Shivastalam is a vast temple visited by many in the Sethu belt of Tamilnadu in Ramanathapuram district (which includes the well known Rameswaram), this shrine has been under the administration of the Royal Sethu Samasthanam, and is well connected by road to many towns in the vicinity. This shrine is regarded as the 9th of the Tevara Stalams in the Pandya region of Tamilnadu. Legend has it that Vaaruni, the son of Varuna was relieved of Durvasa's curse which had given him an elephant's body and a goat's head. Surya is said to have worshipped a blue - diamond image of Shiva here. This shrine was originally known as Parijatavanam; the stala vriksham through the yugams have been Parijatam, Vanni and Kurukkatti Surya is said to have worshipped here, there is a separate shrine for SuryaTejaschandar (Surya Chandikeswarar) here. Architecture: A 9 tiered Rajagopuram (130 ft high) with several stucco figures, beautiful mandapams (esp. 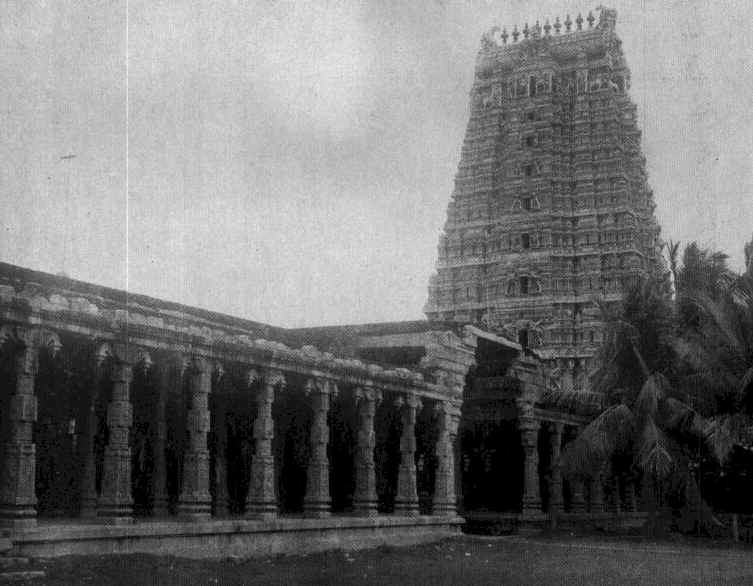 the Chokkatanchari mandapam with 291 carved pillars), well spaced prakarams and majestic walls adorn this temple with a 10 acre spread..Bhaskara Setupati the Maharaja then, carried out major renovations here, under the management of Arunachalam Chettiar and effected a Kumbhabishekam in the year 1900. The next Kumbhabishekam was carried out in 1953. Festivals: The festival image of Ambal is taken in procession in a palanquin each Friday. The annual Bhrammotsavam is held in the month of Vaikasi while the annual festival for Ambal is held in the month of Aadi. 6 worship services are carried out each day. Other festivals such as Arudra Darisanam and Kartikai Deepam are celebrated with great splendour here. The Kailasa Kaatchi festival is celebrated each year to commemorate Sundarar's vision of Kailasam. There are several festival Vahanams and the well known diamond chariots (vairatter) owned by the temple that are used during the annual Bhrammotsavam.